Being able to sit down and eat a meal outside on a nice day is a great experience. But what about being able to prepare the entire meal outside? And we don't just mean grilling. 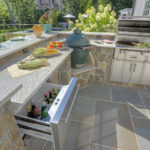 With Hoffman Landscapes, your complete outdoor kitchen is possible. 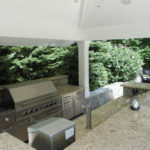 You will be able to spend time outside and prepare your meal in full. 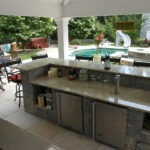 It is the perfect addition for those who love to entertain guests. 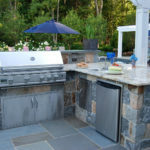 It may be small bits of savings here and there, but using your outdoor kitchen, over time, will help you save on utility bills. Natural ventilation and lighting cut down the cost on your bills. During the summer, your air conditioner is already working hard to keep your home cool. 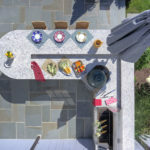 When the kitchen appliances get fired up, the air conditioner will have to work even harder to bring the home’s temperature down to the desired temperature. 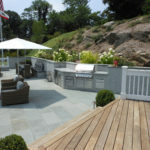 Aside from saving on your energy bills, and a more obvious benefit, your outdoor living space will improve aesthetically. 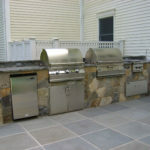 However, relying on any company to add an outdoor kitchen isn’t going to guarantee the results you want. 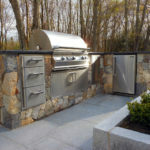 But, choosing our skilled masonry workers will truly allow your outdoor kitchen to come to life. How do we do it? Simple, at Hoffman’s, we bring you one project manager who is immersed fully in all the details of the project. The project manager is surrounded by a team of experts who know what it takes to get the job done right the first time. When you choose us, there is no overlapping of work or duplication of efforts between us and another company, we take care of it all! We are not set with one supplier limiting your options. You are free to choose various materials and products as you need. 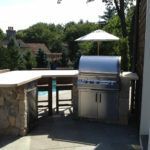 Call us today to start investing in your outdoor kitchen and your dream backyard!